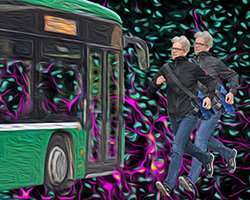 Neurons in a small region of the brainstem called Lateral Paragigantocellular nucleus (LPGi) are active as you try to catch the bus. Think of taking a casual stroll on a sunny Sunday afternoon or running at full speed to catch a bus for work on Monday morning as two extremes. Both forms of locomotion entail a perfect interplay between arms and legs, yet the speed at which this happens is strikingly different. Silvia Arber's group now shows that one particular nerve cell type in the brainstem is essential to implement high-speed locomotion. All forms of body movement including locomotion are controlled at several levels of the nervous system. The ultimate command network for movement resides in the spinal cord. There, nerve cells called motor neurons transmit a motor signal to muscle fibers in order to contract them. But the spinal cord alone cannot make you move. This can clearly be seen in patients with complete spinal cord injury who are paralyzed in body parts innervated by motor neurons below injury. Spinal circuits receive key instructions from the brain about when and how to perform a movement. Recent work makes an increasingly clear case that neurons in the brainstem play fundamental roles in action control. Simply speaking, neurons in this most caudal region of the brain harbor commands to control movement and to dictate how movements ought to be executed. But why has it been so difficult to reveal these principles? The key to identify specific functions of brainstem neurons turns out to be in a very careful disentanglement of cell types. This is how Silvia Arber and her team provide important new insights that were published today in Nature. The scientists showed in mice that the brainstem is, indeed, a mixture of different neurons with clear identities. Brainstem neurons were dissociable by the neurotransmitters they release. They also differed by their location in the brainstem, by the connections they make to neurons in the spinal cord, and by inputs they receive from other brain regions. Most intriguingly, mixed up in a salt and pepper pattern, positively-tuning so-called excitatory neurons are adjacent to negatively tuning, inhibitory neurons in the studied brainstem regions. Strikingly, if all of these neurons were studied together, no clear pattern with respect to the elicited motor program emerged. Paolo Capelli, PhD student in Arber's group and first author of the study, remembers that the most exciting breakthrough of the project was when he started to study the identified neuronal cell types separately: "When we activated neurons releasing the excitatory neurotransmitter glutamate in one small region of the brainstem called lateral paragigantocellular nucleus (LPGi), but not in other neighboring regions, we reliably induced full body locomotion at short latency." Conversely, if the neurobiologists activated the intermingled inhibitory neurons, they observed a rapid slowing down. As Capelli points out "it was absolutely fascinating to see how one population of neurons in the brainstem can elicit a full motor program that recruits both fore- and hindlimbs and all the muscles involved in a manner indistinguishable from natural locomotion." Further experiments demonstrated that the identified excitatory neurons, the stimulation of which elicits locomotion, are also needed during natural locomotion at high speeds. Without these neurons, efficient running at high speeds was no longer possible. These findings provide an important step forward for a better understanding of the neuronal underpinnings at work in the brainstem during the control of movement. Silvia Arber comments: "We know now that the different locomotor functions in the brainstem were historically masked by the diversity of intermingled neuronal subpopulations. Only once you divide them into these subpopulations, you can reveal their function." In the long run, these findings may also provide an entry point to intervene in diseases in which movement is impaired due to defects in higher motor centers such as in Parkinson's disease.